DOS Viewer is simple program for viewing NFO and DIZ files. These files often contains graphics or logos (also known as ASCII art) drawn using special characters. These characters looks very good in text mode, but they look strange in Windows programs (such as Notepad). 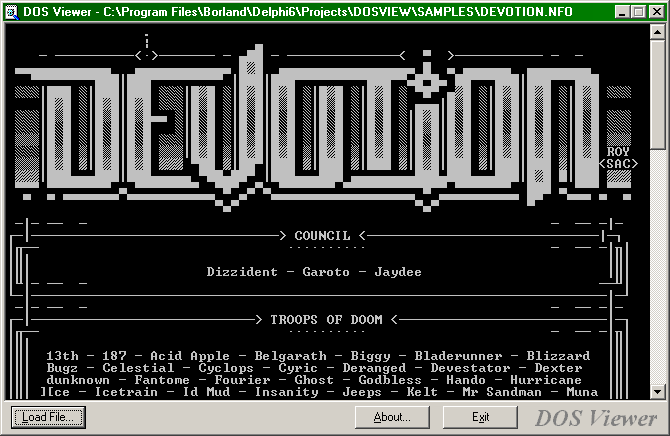 DOS Viewer allows you to view these files in Windows too and experience the ASCII art. DOS Viewer automatically associates with NFO and DIZ files, so you can simply double-click them to view them with DOS Viewer. 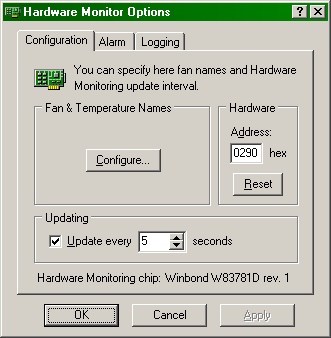 Hardware Monitor is simple Windows 95/98/NT/2000 program for monitoring temperatures, voltages and fan speeds on motherboards with LM78 and Winbond W83781D Hardware Monitoring chips (tested and developed on Asus P2B). Now fully configurable, with powerful logging. 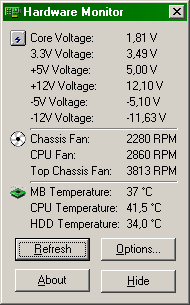 I stopped the development because there are too many different chipsets and hardware monitoring chips. There are other programs that can handle them. One of them is Motherboard Monitor (which I don't like). I released full source code (developed in Borland Delphi 3, then 5 and this beta compiled in Delphi 6 Personal). To build HwMon, you need TTrayIcon and TDlPortIO coomponents. All this data is useul only when opening the file in program that created it. Other programs such as Internet Browsers are just skipping this data, so the data is downloaded ant then thrown away! Just use this program when publishing JPG files on the Internet and your JPG files become smaller (if they contain non-picture data) with NO QUALITY LOSS. Usage of DOS and W32Console versions is very simple. 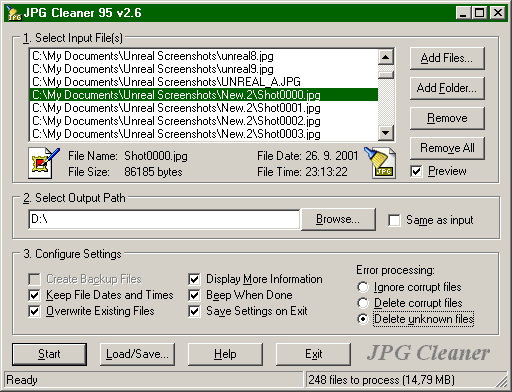 Just type jpgclean.exe picture.jpg to clean picture.jpg file or jpgclean.exe *.jpg to clean all JPG files in current directory. The Win32 version is easy-to-use. Step-by-step instructions are included in the readme text and help file. For complete revision history, read the readme.txt file. ZIP file contains DOS, W32Console and Win32 versions. 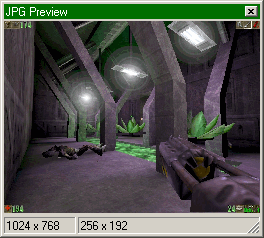 W32Console version can only be run in Windows 95/98/ME/NT/2000 and supports long file names. DOS version runs everywhere and supports only DOS 8.3 file names. Win32 version runs in Windows 95/98/ME/NT/2000. UniFlash (Universal Flasher) is program created by Pascal Van Leeuwen and Galkowski Adam. It was abandoned in 1998 (v1.17b). It was almost dead project, but it LIVES AGAIN NOW! UniFlash supports a wide range of chipsets and Flash ROMs (read uniflash.txt for a list, it's also included in the ZIP package). Since v1.40, UniFlash is licensed under GNU GPL v2. Warning: This program is for experienced users ONLY. Improper use of this program (when you flash a WAV file instead of BIOS image to your Flash ROM) or bug in the code (especially with untested hardware) can cause your motherboard to not work. If you do this, I AM NOT RESPONSIBLE for that (original authors aren't too, YOU ARE). To make your motherboard work again, you need to hot-flash your Flash ROM or use external Flash ROM programmer. You can have a look at BIOS Forum at Wim's BIOS Page: http://www.wimsbios.com/phpBB2/. Some VIA and AMD chipsets don't work - maybe because non-standard flash write protection on some boards. Garbage on screen instead of flashing - on Asus P5A board with Aladdin V and 256K Flash ROM, but it works OK on Micronics C200 (same chipset and 128K Flash ROM). On PC Partner VIB8x4DS board with VIA Apollo VPX, UniFlash flashes the SyncMOS F29C51002T chip OK but then hangs with garbage on screen. This problem appears to be associated with SyncMOS Flash ROMs only. Support for ServerWorks, UMC, new VIA and new SiS chipsets because datasheets are unavailable (these companies are simply ignoring e-mails). I can't do much with only "unofficial" info. For complete revision history, read the uniflash.txt file (it's also included in the ZIP package). How to install Windows Media Player 7.1 on Windows 95 and NT - look here.